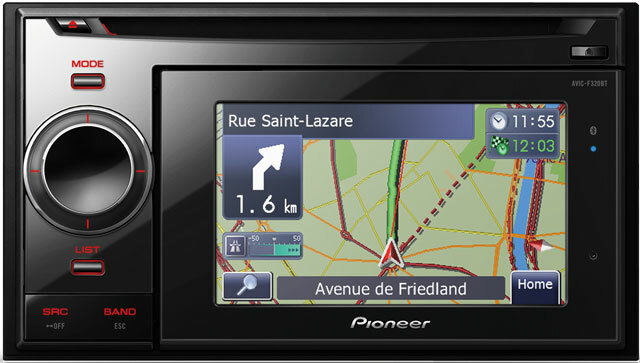 The essentials of GPS and multimedia in one system. Fully integrated in your car, the AVIC-F320BT offers a convenient and reliable solution for all your navigation and audio needs on the road. You can easily access any function using the detachable 4,3 inch (10,9 cm) touch screen with customisable shortcut menu. The screen is detachable for your peace of mind.. Benefit from improved Tele Atlas map data covering 44 countries and more than 2.3 million points of interest. Using NavGate Feeds, you can also add you own POIs. Avoid traffic jams via the Traffic Message Channel (TMC), advising you of hot spots in real time, and suggesting alternative routes. Play music from your preferred source: CD, USB memory device or iPod/ iPhone (Direct Control via optional cable). You can also play compressed videos from SD card using the NavGate Feeds App. Calling via Bluetooth is supported, and what's more: the Parrot Bluetooth module can store, manage and call up to 300 contacts from four different phones. A microphone is included. The AVIC-F320BT fits in most cars with a 2-DIN slot. With custom button illumination, you'll be able to match your car's - for perfect integration in your dashboard. Voice Guidance Languages 18 languages supported: UK English, German, French, Spanish, Italian, Dutch, Flemish, Swedish, Danish, Portuguese, Norwegian, Polish, Greek, Finnish, Czech, Hungarian, Romanian, Turkish .